At my firm, I often get calls from accident victims who were in a wreck but weren't wearing a seat belt, and who are now dealing with an insurance company that's trying to devalue their claim because of it. The simple question is this: can insurance companies pay you less because you weren't wearing your seat belt during an accident? Yes they can, but only if you let them. It's still possible to recover full compensation for your damages and injuries (think medical bills, missed work wages, auto repairs, etc.) even if you weren't wearing your seat belt. Some people are surprised to learn that insurance adjusters aren't always on their side. If you're in a wreck that was someone else's fault, you'll make a claim against their insurance company (the other driver caused the wreck, so it's their job to pay for your damages and injuries). However, just because you make a claim doesn't mean the insurance company will pay you what you deserve. They don't want to pay out a ton in claims because the more money they pay out, the less the company makes in profit. So instead, insurance adjusters look for ways to devalue or deny your claim. If you weren't wearing a seat belt at the time of the accident, they might try to use it against you. You should know that under Texas law, if you were hurt in an accident caused by another driver, you have a right to full compensation regardless of whether or not you were wearing a seat belt. If the insurance company refuses to pay the full amount of your medical bills because you weren't wearing a seat belt, they'll likely say it's because you contributed to your own injuries. "Your injuries wouldn't have been as severe if you'd worn a seat belt, so we don't want to pay for them." While this is true, it doesn't automatically bar you from recovering full compensation. This is because the at-fault driver (and their insurance) must PROVE that your injuries would have been significantly less had you been wearing a seat belt. It's not enough to just say so - they have to know it's true. This is called the burden of proof. If the insurance company can't prove that you contributed to your own injuries by not wearing a seat belt, then they cannot devalue your claim over it. Do You Need a Lawyer's Help? Not everyone needs a lawyer. If your medical bills are relatively low, for instance, your case is "small" (in the insurance company's eyes) and you probably don't need a lawyer. Similarly, if the insurance company isn't giving you any trouble, you could be good on your own. On the other hand, if you're dealing with huge medical bills and serious injuries, it could be worth consulting with a Board Certified personal injury attorney. 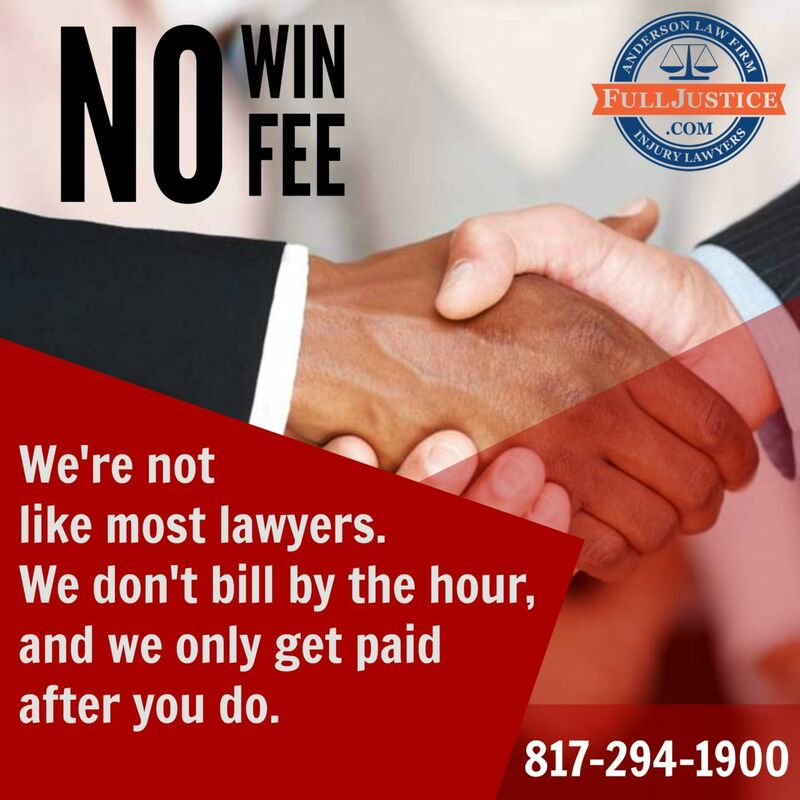 Contact the Anderson Law Firm today to talk with a board certified Fort Worth personal injury and wrongful death lawyer. We offer all injury victims and their family members completely free, no obligation consultations. Call us toll free at 800-354-6275 or locally at 817-294-1900.